I was one of many thousands of people marching through central London on a cold day at the end of February, to protest against the Government’s plan to renew Trident at a cost of around £100 billion. Along the way, there were many light hearted contributions to cheer on the marchers. I saw a little dog proudly sporting a coat with the CND symbol, and a pair of friends carrying a banner which read “Exasperated Older Women Demand NHS not Trident”. There was also a lovely hand-painted banner showing Poseidon , god of the sea, rising from the waves and breaking a bomb in half. Having marched from Marble Arch, we arrived in Trafalgar Square in good spirits and stood for the rally in front of the National Gallery. While we were waiting for the speakers to arrive, there was a big screen showing photos of Peace demonstrations over the years, from Aldermaston marches to Greenham Common and beyond. We then had a very exciting and inspirational range of speakers, including Nicola Sturgeon, leader of the SNP in the Scottish Parliament, Leanne Wood, leader of Plaid Cymru, Caroline Lucas, Green MP, Christine Blower, general secretary of the NUT and Bruce Kent, veteran campaigner. The Vanessa Redgrave spoke in a personal capacity, very emotionally saying it was one of the best days of her life to see so many people out demonstrating in a direct way, seldom reported in the mainstream media. Finally after a two hour wait, Jeremy Corbyn spoke. Most of the marchers had waited to hear him. He reminded them of the devastating effect nuclear war would have, and urged people to carry on campaigning. After the rally, I went to have a coffee and got chatting to an old couple from Chester who had come down for the day to join the demo. The husband told me he had joined the Labour Party for the first time when Jeremy Corbyn had been elected leader , and that he and his wife travelled up and down the country attending rallies and marches. It was good to hear so many people having an alternative view on Trident renewal. Unfortunately at the moment, the Tory Government is hell bent on pressing ahead with it. It will be up to Corbyn and others in the Parliamentary Labour Party to see if they can persuade MPs to vote against its renewal. ENDPIECE: Labour’s new leadership claimant? Not all members of Jeremy Corbyn’s Parliamentary team are happy with his leadership. There are quite a few who would be more than happy if he departed back to the backbenches where they feel he belongs. There are, of course the residual Blairites who dream of a time when “New Labour” rises like a phoenix from the ashes. And there are those who just feel that Jeremy has upset their cosy Parliamentary consensus. Already the media is suggesting that much depends on the results of the local elections in May. If Labour doesn’t do well, then a challenge could emerge. Indeed there’s a sneaky suggestion that some would rather that their own party didn’t do well. But one question emerges – who is going to mount the challenge? At one time the speculation was that Hilary Benn would be the one to to give it a go, after his speech during the Trident debate. But now the bets have shifted to another contender – to Barnsley Central MP, Dan Jarvis. Jarvis is identified much more clearly with the Blairite camp than Hilary Benn. At a speech to the Blairite Think Tank, “Demos” he openly attacked the economic policy of the Corbynistas – and he has received the backing of Lord Mendelson, one of the original Blairite cabal. Mendelson has never been subtle in his opinions. On top of that, former paratrooper, Dan Jarvis has received a tidy donation of £16,800 that could be put towards any bid for the leadership. But a couple of points that should make the dissidents pause to reconsider. First, Jeremy Corbyn is gaining support amongst the voters (look at the welcome he received from the NUT). And, second, what of Labour’s growing membership – those who joined the party simply because Corbyn offered a new style of politics – one that reached out to them, and to the electorate at large? We’ve come a long way since that black day in June 2015 when the bulk of Labour MPs abstained on the Tory Bill for “welfare reform”- on the instructions of the (then) Labour leadership. A viewpoint piece by Mat Davies. There are many reasons to stay in or to leave the European Union. Economic arguments from both camps provide valid and inconclusive evidence. The truth is that either outcome is a gamble. It is equally true that migration could be more carefully regulated. However, there is evidence that suggests that migration adds to our tax intake. The same contradictions permeate most policy areas from health and safety, to security. Nonetheless, I have been engaged in EU politics since my teens. The core concerns of the “leave” campaigners is old hat. “If we leave the EU won’t we be able to make our own laws” ? Not really. Yet that is the overwhelming argument sprinkled with words like “sovereignty”. Externally, we will still be bound by the trade regulations decided at the World Trade Organisation, and our banking standards will be set through the Bank of International Settlements. There are scores of institutions and treaties that limit our “sovereignty” including laws regarding torture, safeguarding refugees, and engaging in military action. The “out” campaign effectively argues against them all. Moreover, the limits to the “state” of the UK are internal and external. There are three relatively recently devolved nations that have law-making powers. Plaid Cymru in Wales and SNP in Scotland, among local governments, all point to the negative outcomes of centralised power in Westminster. Supra-nationality and devolution has clearly undermined the role of a “centralised state”. Indeed, governance, rather than governing has become the norm, not the exception. The European Union has enshrined democratic principles into the Treaty of Lisbon, and more power has been granted to national parliaments. Moreover, subsidiarity is solidified through the Committee of the Regions that responds to regional interests within member states. Power is fragmented across across political and legal institutions in a federal manner. What is all the fuss about? It is true that the EU is obscure, complicated, and requires education at all levels. Instead, many politicians have outsourced policy failure and invoked innate nationalism during many domestic hurdles. The only news programme on the BBC that shared what happens in Strasbourg and Brussels was cancelled a few years ago. Nonetheless, negative stories have tended to make the headlines, and the lack of EU information has added to EU misunderstanding and scepticism. Furthermore, a broad turn towards nationalism is a partial consequence of the undermining of international law, noticeably during the Bush/Blair administrations. That was extremely harmful policy hypocrisy. For example regarding torture and environmental agreements. The post-war consensus effectively lost its legitimacy in the eyes of many . Internationalism appeared as a tool to colonise by exporting policies that benefited the US and UK. At the precipice of the referendum, we should reflect on the following. The undermining of the Concert of Europe ushered in World War 1. The dissolution of the League of Nations witnessed the rise of fascism and World War 2. The arguments presented by the “leave” campaign, although often valid, fail to present a vision for the future. I believe that even with its shortcomings, we are better in the EU . History has proved internationalism as wise and nationalism vile. 1951: France and West Germany formed the European Coal and Steel Community. MARCH 1957: France, West Germany, Italy,Netherlands, Belgium and Luxemburg sign the Treaty of Rome setting up the European Economic Community (EEC). The EEC formally came into being in January 1958. JANUARY 1973: Britain, Ireland and Denmark joined the European Community. 1993: The European Community (EC) becomes the European Union (EU). By 2007 there were 27 member states in the European Union. In our last issue, we highlighted the woes that had befallen the Dean Academy in Lydney. A new permanent Head was being sought, and interviews took place in February. But judging from the school’s website no appointment has yet been made. It is still hoped that the new Head will begin the new school year in September, with the present acting head, John Barrett, staying on as part-time adviser. The website outlines the post-Ofsted action plan that has been put in place to lift the school out of “special measures” which is already being acted on. Ofsted will no doubt be visiting in the not-too-distant future, to judge whether the action plan has been effective. Speaking of Ofsted, its chief, Michael Wilshaw has been commenting on the “brain drain” of teachers to work abroad. He is seeking ways to persuade at least newly-qualified teachers to spend two or three years teaching here. But Ben Culverhouse, a junior school teacher from Somerset, writing in the Guardian, believes Michael Wilshaw is part of the problem. Michael Gove, when Minister for Education, instructed Wilshaw to “raise standards”. Ofsted “suddenly got nasty”. Good schools were deemed to be coasting and any weakness in a school was ruthlessly exploited. This policy, of course, went hand-in-hand with the Gove/Cameron objective of academisation. Any school judged inadequate could be forced into becoming an academy. The belief in the efficacy of a “could do better” approach to teachers and schools is epitomised by a reported remark to the Guardian by Wilshaw in 2012: “If anyone says to you that staff morale is at an all-time low, you know you are doing something right.” Unbelievable! No wonder teachers are leaving in droves. And pupil numbers are set to rise by one million by 2022. Apart from a general teacher shortage, there are shortages in particular areas. 73 per cent of Heads say that they are having to resort to putting teachers not trained in the subject in front of classes. Maths, with 78 per cent of schools using non-specialist teachers, and Science (75 per cent) are the most worrying, and languages (33 per cent) are also having problems. One of the side-effects of the emphasis on exam results was high-lighted by “Secret Teacher”, an anonymous contributor to the Guardian. She writes of how the A Level and GCSE groups are assigned specialist teachers whilst the others often have non-specialists or long term supply teachers. Key Stage Three (the first years at Secondary School) are the ones who lose out. “If your performance is judged completely on exam groups and you’re creaking under the strain of an unsustainable workload of 60-plus hours a week, you’re going to cut corners, and it’s going to be in Key Stage Three,” writes “Secret Teacher”. It seems that our own MP, Mark Harper, is all in favour of tests. Previous expectations have been too low, he wrote recently in the Forester. He approves of the new tests this year for Key Stages One and Two (incidentally Key Stage One tests were abolished around 2000 but are now being brought back). Harper thinks it essential that schools are “held to account” for their pupils’ performance – and that they will be required to publish results. Testing and more testing Mark Harper thinks is bound to raise standards so that “the next generation have the skills they need to succeed in today’s competitive global market. It was George Osborne’s budget that dropped an unexpected bombshell. We were told, abruptly, that all schools in England should become academies by 2020 – a change that will affect 15,000 schools. Teachers’ organisations were all but unanimous in opposing these plans – and Jeremy Corbyn, speaking at the annual NUT conference roundly condemned the pan as “an ideological attack on teachers and on local and parental accountability.” He received a standing ovation. Meanwhile, education minister, Nicky Morgan, floundered against a hostile audience in the Commons. Meanwhile, it’s worth noting that as Wales and Scotland have control over their own education, their schools will remain firmly under the direction of local authorities. The majority of England’s NHS trusts are in deficit, with no way to claw their way back without making drastic cuts. Yet the Health Minister Jeremy Hunt has denied them the means to get back on even keel without cutting NHS services and front line jobs. According to recent figures, deficits continue to rise with 130 out of 150 trusts in the red, and the number is rising. Barts, in London, heads the list with a deficit of £134 million. Meanwhile any share of the £1.5 billion “transformation fund” for 2016-2017 are to be denied them. Hunt has demanded that trusts “balance the books without compromising patient care” if they’re to get any of the much-needed cash injection. In other words, if you really need the money you can’t have any. Meanwhile, guidance from the NHS regulator “Monitor” has urged those trusts in deficit to agree action that would include “headcount reduction”. In other words, by sacking staff. How this is compatible with Hunt’s drive to recruit more doctors and to bring in 24-hour cover to hospitals is not explained. Meanwhile, campaigns in defence of our Health Service and those who work in the NHS continue. In many parts of the country there have been marches in support of the junior doctors who have faced a “take it or leave it” ultimatum from Jeremy Hunt in his insistence on imposing new hours and conditions. Other demonstrations have focused on declining conditions in hospitals – including those in Gloucestershire. In March campaigners from across the county rallied in a march through Cheltenham in support of junior doctors and to protest against the lack of adequate funding for the NHS generally. Protesters also showed their support for the doctors outside the Gloucester Royal. As we go to press the junior doctors have given notice that they intend to accelerate their campaign against the new conditions being imposed on them by Health Minister Jeremy Hunt. Further strike action will take place on April 26 and 27 – and on this occasion there will be no emergency cover provided. So what has provoked this hardening of attitude amongst the doctors? It can be summed up in two words. Jeremy Hunt. It was his decision to break off negotiations and impose a deal willy nilly that in its present form is unacceptable to the doctors involved. Hunt’s response was to declare that “the matter is closed.” The BMA spokesman for the junior doctors responded by saying that “The Government will bear full responsibility for the first full walkout of doctors in this country. And with the intransigence of the Tory Government, this is likely to get worse rather than better. 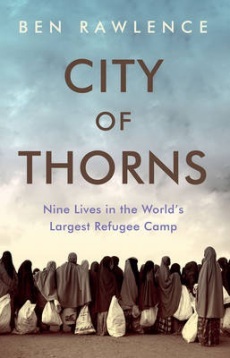 ‘City of Thorns: Nine Lives in the World’s Largest Refugee Camp’ by Ben Rawlence. Published by Portobello Books. Ben Rawlence, the author of this remarkable book, is a human rights watch observer. Over the course of four years he was a first-hand witness of life in Dadaab, Kenya, home to half a million refugees. Dadaab is deep in the desert where only thorn bushes grow, hundreds of miles from any other settlement. Aid is provided by the UN and channeled through an army of charities and aid workers, and the city runs on a grey economy. Most of the refugees are Somali fleeing from the consequences of the civil war of 2008, when control of most of the country was seized by al-Shabaab, an al-Qaida-linked organisation. Others are from Sudan, Ethiopia, or Darfur. Many of them walked for days, often in family groups, to reach the comparative safety of the camp. Rawlence interleaves the stories of nine individuals – and touches on many more – into his account of life in the camp. There is Guled, taken as a child soldier, who manages to escape and hitch a lift to Dabaab. Through his story we learn the hugely protracted process of registering in the camp for aid. Other characters include Kheyro, a dedicated student pinning her hopes on escaping the camp by means of one of the very few available scholarships. There is Tawane, a youth leader, who organises distribution for the newcomers to the camp and does his best to stay out of trouble. With so many different nationalities in such an environment, unsurprisingly conflicts arise. And there’s always the risk of infiltration by al-Shabaab. Indeed, terrorist activity erupts more than once, resulting in the temporary withdrawal of aid workers, so that refugees like Tawane with a measure of responsibility have to ensure that basic services keep running. The inhabitants of Dadaab are in limbo. No-one wants to acknowledge that it has become permanent, but some have been there for over twenty years. A few decide to return to their homes and are given a resettlement package, though war in Somalia is by no means over. A very few are given papers for a new life in the western world. And some decide to strike out on the long and dangerous journey to Europe by way of the Mediterranean or Turkey. City of Thorns came to my notice through an article by Ian Birrell in the “i” newspaper, entitled “Exposing the refugee camp myths”. Clearly, says Birrell, these camps are not a humanitarian answer, though it is a convenient one for politicians. Sir Alan Duncan, then Minister of State for International Development, said in 2014: “You know where they are when they are in camps.” Birrell writes, “What human being wants life trapped in limbo dependent on others for everything?” What they need, says Birrell, is the right to work legitimately so they can build a fresh start. There needs to be a proper resettlement plan in which all first-world countries play their part. At present the West is considering a deal with Turkey to contain up to two million refugees within their borders, housed in huge UN funded camps. Anyone who thinks that this is an acceptable solution should read ‘City of Thorns’. We need investigative journalists like Ben Rawlence to tell it like it is. The Independent, both its daily and Sunday editions, is being phased out – at least in printed form . Both papers are now going “on-line” only. The daily edition of the paper first appeared in October 1986 as a soberly produced broadsheet (the Sunday edition was to come some years later). It attempted to provide a progressive, independent coverage of news and opinion, and soon settled down to provide a “quality” take on issues of the day. In more recent times financial problems forced it to lose some of its independence when it was taken over by Russian oligarch, Alexander Lebedev. But, to be fair, his role was to bank-roll the papers involved without interference in the content of the “Indie”. The papers maintained a non-party-political line and continued to provide a voice of sanity in a media world increasing dominated by the right-wing press. It goes without saying that there will be jobs lost. Sadly, the Independent was no longer in the business of making money. As losses mounted, the owner decided to pull the plug. The print edition would cease – and the cut-price “i” would be taken over by the owner of a string of regional newspapers, including the Yorkshire Post, Sheffield Star and the Scotsman – Johnson Press. And so the balance in the press tilts even further to the right. And such papers as the Sun, the Mail, Telegraph and the Daily Express, now dominate the print media whilst spewing out a daily diet of anti-trade union and xenophobic rubbish that often bears very little relationship to the truth. Out of the major players only the Guardian and the Daily Mirror remain to attempt to redress the balance. It wasn’t always thus of course. Before Murdoch arrived from Australia to launch his newspaper empire in Britain, there was a much more level playing field. The first major casualty was the News Chronicle. It was a progressive liberal paper, owned by the Cadbury family. It still had a circulation of over a million – yet, without any warning, its owners abruptly decided to sell it to the Daily Mail for a derisory sum. Whether the Mail gained any readers from the purchase is doubtful. News Chronicle readers were outraged. A packed meeting was called to protest – but there was little that readers could do. They were presented with a fait accompli. The next left-of-centre newspaper to fold was the Daily Herald. The Herald had once been the paper of the Labour Party, and in its infancy had been edited by George Lansbury. Although its trade union backers had sold out, it still maintained a sizeable circulation – and still backed Labour. Until it decided to transform itself into the Sun. The new Sun was not a success and was easy pickings for Rupert Murdoch when he came looking for a daily paper to add to his portfolio. He soon transformed it into what it is today. Another casualty during those years was the long established Sunday paper, Reynolds News, owned by the Co-operative movement. Until, that is, the Co-op decided to close it down. This shift in the balance of the press has taken a few decades to achieve, but the result can be seen on any news-stand or in any newsagent. And we’re all the poorer for it as a result. However, the newspaper industry remains in a state of near crisis, with circulations falling. Take the Guardian, for example. This long established journal of the metropolitan left has seen its sales sink to critical levels. In 2000 it was selling 401,560 daily. Today it’s sunk to a circulation of 164,163. Alarm bells are now ringing. Faced with this situation, the Guardian is cutting back. It is seeking 250 redundancies (including one hundred editorial jobs). It’s hoped that these job cuts will be achieved by voluntary means. But, of course, cuts on this scale could well be the start of a downward spiral. Few newspapers, it seems, are immune. Even the Murdoch camp has been affected. During the same period the circulation of the Sun has sunk from some three and a half million to 1,787,000. The drain in sales has been blamed on the rise of the “social media”. In the circumstances, it seems strange that the Mirror group chose to launch a new newspaper – a rather anodyne daily called the New Day. Having read the odd copy, it’s difficult to know what niche market it was aimed at. There are those in the Parliamentary Labour Party who refuse to accept the fact that Jeremy Corbyn was elected leader of the Labour Party fair and square. They act as though their exclusive little club had been invaded by an uncouth outsider and go out of their way to make it difficult for Labour to function as a cohesive opposition in the Commons. Few of them, though, go so far as to advocate openly outright rebellion. They prefer to throw their toys out of their play pen. Or sit in the corner and sulk. But it seems there are those who are ready to plot a coup in the party. An interesting, if somewhat incoherent, piece appeared in the Daily Telegraph in early March by one Tom Harris, an unreformed and unrepentant Blairite. He’s all for mounting a coup to oust the “selfie-loving Corbynite radicals” (sic). And he’s nominated deputy leader Tom Watson to lead the rebellion against Jeremy Corbyn. Why Tom Watson, I hear you ask? Well, according to Harris , it was Watson who master-minded the plot that got rid of Blair and replaced him with Gordon Brown. A politician capable of achieving that should have no difficulty in master-minding a coup against Corbyn. Well that seems to be the logic behind this rather rambling article aired in the Telegraph. I must say that I was completely unaware of such a plot to get rid of Blair – but us dinosaurs do tend to be a bit naïve. We just don’t live in the world of plots and counter-plots . Of course there’s no evidence to suggest that Tom Watson has the slightest inclination to attempt such an act. And such fanciful notions don’t take into account the reaction of Labour’s membership. But then, of course, the Blairites never did. Remember the British National Party? The far right, racist party that seemed to be making such an impact a decade or so ago? Then it imploded and seemed to disappear from the scene. But an interesting news item recently revealed that the party had come into some money. £180,000 had been left to the BNP by two members who had died and left the money in their wills. The organisation “Hope Not Hate” has accused the BNP of gaining money through “coffin chasing”. The name of Adrian Beecroft isn’t perhaps very well-known – unless you’re in the heady world of hedge fund banking and the like. He’s currently part of the financial set up that controls Wonga. But before that he was “chief investment officer” for a venture capital financial outfit called Apex. One of his acquisitions was that of the supermarket chain, Somerfield. Somerfield, it seemed, had run into difficulty after it took over KwikSave. Merging the two concerns had cost more than had been bargained for. Mr. Beecroft was able to acquire Somerfield in 2005 – and then, in 2009, it sold it on to the Co-operative Group at a handsome profit. Apex did very well out of it, the Co-op did less so. Now many of the Co-op’s former Somerfield stores have been sold on (like the one in Chepstow, for example), in order to finance its growth in the smaller convenience store sector. Incidentally, Mr Beecroft has donated more than £500,000 to the Tory Party since 2006. On March 10th bailiffs and security guards, acting on behalf of local developer, Brian Bennett stormed Yorkley Court Farm. They were there to stage a forcible eviction of the “eco-gardeners” who’d been in occupation of the site for some years. This was the second attempt by Bennett to evict the occupants – and this time it was in earnest. Farm buildings were trashed, and the iconic tower that stood at the farm entrance was demolished. 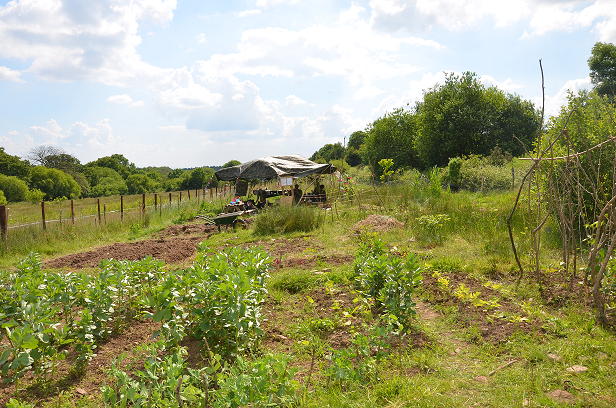 Since Mr Bennett mounted his first attempt to take over the farm from the occupants the “eco-gardeners” have gained quite a lot of sympathy from those in the area – many of whom saw the re-vitalisation of the once derelict farm as both a credit to those who’d been working it and an asset to the wider community. Harassment by hired security guards hadn’t helped Mr Bennett’s cause. Indeed, after the eviction was mounted a walk along a right-of-way through the farm’s fields was hastily organised in sympathy with the “eco-gardeners”. The right-of-way had long been used as a route for local folk to take a stroll or to exercise their dogs. But there’s been a number of complaints of threatening behaviour by security guards towards those engaged in such harmless pursuit. This support was reflected in the columns of the local press. On the letters page of the Forester, for example, Coun. Andrew Gardner (Lydbrook and Ruardean) reminded readers that the occupants at Yorkley Court had been in residence for six years, “growing organic food and following an environmentally friendly lifestyle”. He reminded us that the previous owners of the farm had died intestate, but that “relatives gave permission for the community to reside in the grounds”. He went on to suggest that a public inquiry into the whole affair “must urgently be implemented”. Another letter suggested that scenes surrounding the eviction would lead onlookers to think that it was Al-Qaeda in occupation of Yorkley Court. Over 70 police officers were counted at one point, some in riot gear. A helicopter flew overhead for the best part of two days. A police presence may well have been justified (if only to keep an eye on Bennett’s security guards), but in this case it looked as though the numbers were there to intimidate. Letters of support for the eco-warriors continued in the following week’s issue of the Forester – with an added news item pointing out that a footpath adjoining the farm had been closed without notice, “at the request of the police” – in order, it said, to help in the eviction of the occupants. At the time of writing, the eco-gardeners have left Yorkley Court farm with the defiant message, “our homes are gone but our community will live on.” 16 arrests were made and the homes of the occupants were demolished. BRIAN BENNETT, the man behind the eviction of the occupants of Yorkley Court Farm, is a developer. His major achievement was the transformation of Vantage Point near Mitcheldean into a busy industrial park after the closure of the Xerox works on the site (Xerox, incidentally, once employed over a thousand at its works there. By the time it closed it was down to about 80). “Bee Green Energy Ltd., which was set up to develop wind farms. And, last but by no means least, Yorkley Court Farm Ltd. which was registered on 27th April 2014. Incidentally, it was on the 29th June 2014 (the same year) that bailiffs and security guards first entered Yorkley Court Farm to try to evict the occupants. On this occasion the confrontation ended in a stand-off, and the security guards were withdrawn. Mr. Bennett, it would seem, has collected a range of irons in his fire. A lot of water has flowed under many bridges since the Wurzels recorded their hit song “When the Common Market comes to Stanton Drew.” But over the years Britain has continued to have what might be called a problematic relationship with the rest of Europe. For starters, initially we didn’t seem to know whether we wanted to be in or out. Early negotiations to join the EEC (as it was then known) were vetoed by French President, Charles De Gaulle. When we were finally given the go-ahead to apply for membership there were decidedly mixed feelings over whether we should join up or opt out – resulting in a referendum in the UK. At that point we did have alternatives. There was the European Free Trade Association (EFTA), a rather looser collection of European countries, which at the time included Britain. Another option favoured by some politicians was to attempt to bolster trade with Commonwealth countries, which had at one time been significant but was by then shrinking significantly. Harold Wilson allowed Labour colleagues a free rein on whether to back membership or to turn our backs on the EEC. The result of the referendum was clear cut. A majority of those taking part voted for UK membership of the European Economic Community (which later morphed into the European Union). One important factor that made such membership different from other alliances or treaties that had bound us before was the fact that the EEC/EU wasn’t merely a trading bloc. It had aspirations towards nationhood, with its own parliament and civil service, which was responsible for a far wider remit than just trade. Important, too, was the European Court of Justice, and the European Central Bank. A common currency followed – the Euro. It even has its own flag. It seems bizarre that any nation state should choose to affiliate to a body such as the EU and at the same time follow a “pick and mix” attitude towards its rules and conditions. But meanwhile a further development that was to have a profound impact on the European Union was the collapse of Soviet hegemony in Eastern Europe. Countries behind the “iron curtain” were bound together by their own trading partnership, the Warsaw Pact. Now this had collapsed, resulting in a flood of new applications for membership of the EU from the east, many with very different aspirations and expectations. These had to be accommodated though not always without a degree of friction. The latest test for the European Union has been the refugee crisis. With hundreds of thousands seeking entry to Europe annually, the notion of a Europe without borders (contained in the Schengen Agreement) has effectively broken down. European partners are breaking ranks and reverting to acts based on their perceived “national interests”. Razor wire fences and border posts are replacing the concept of free passage. Maybe it’s inevitable that Cameron should exploit these troubled times to seek a “re-negotiation” of the terms of our membership of the European Union. After all, he’s always been a politician with an eye to the main change. His claim to have won a “better deal for Britain” has been hotly disputed. The question we would ask is “whose Britain?” That of UK business interests maybe, but it has done nothing to ease the lot of ordinary people in Britain. Cameron’s deal further threatens human rights whilst doing its best to aid big business interests. Meanwhile publicity over his shabby deal has succeeded in shoving the likes of UKIP back into the spotlight. Which brings us to June’s referendum. Once again we’ll be voting either to stay in or to get out. And a new word has been coined for it – “brexit”. Already the debate on it has divided the Tories, with leading figures such as Boris Johnson, Michael Gove and Ian Duncan Smith lining up with the “out” campaign. There are of course also divisions on the left, though these have been less high profile and certainly less vocal. And as far as the Labour Party leadership is concerned, its views have been so low profile as to be practically inaudible. Maybe it’s time for Labour to speak out on Europe. There remains a powerful argument for remaining part of the EU and taking part collectively in its debates and decision-making. That’s the way to influence its agenda. The EU certainly has its problems and imperfections, but the Cameron approach will do nothing to overcome these. No doubt we’ll be able to return to the debate in our next issue – either in our print edition or on line.